90 Day Fiance stars Ashley Martson and Jay Smith have been dealing with continuous hurdles. Ashley recovered from a serious medical issue. On top of that, she and Jay had some fights about lack of communication and trust in their relationship. The couple made up on this week’s episode with a very sweet scene that made us all root for them and hope to see this couple make it to the altar. Unfortunately, things quickly went south again. Soon after, viewers saw Ashley and Jay receive racist and vile messages. Over a hundred comments were posted on their public wedding website. Almost all of those hundred comments contained the N-word. From the beginning of the season, concerns about racism were a huge part of the couples’ storyline. 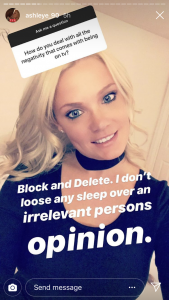 Ashley speculated how people in her neighborhood would react to her Jamaican fiancé. Jay expressed concerns about being targeted by law enforcement. While the interracial couple may have attracted attention, they never had to deal with threatening and abusive language before. In his confessional during the episode, Jay broke down with emotion. He said that he’s never experienced anything like that before. But Ashley has been taking steps to protect herself and Jay and putting the negativity behind her. 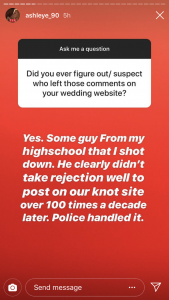 The wedding website that included the date and location of the wedding has been deleted. Police intervention has shut down the culprit. Hopefully, Jay and Ashley can put this incident behind them. It’s something no one should ever have to deal with. TELL US- HOW WOULD YOU REACT IN THIS SITUATION?